“Powering the Future.” A 2012 Chevy Volt electric car is Greenville High School’s Auto Tech project for the upcoming school year. GREENVILLE — Area residents might catch a “glimpse of the future” driving the streets of Greenville this summer. The Greenville High School Auto Tech program has announced that its 2015-16 school year project, “Powering the Future,” is an electric automobile. “We hope to get the whole community involved,” he said. Unlike gasoline or diesel-powered vehicles, the 4-cylinder, 1.4-liter engine of the Volt is driven solely by electricity. The car does contain a 9.3-gallon gas tank, however, which can charge the battery when the electrical charge has run out. The vehicle is charged through a port on the driver’s side. The school has owned the car for approximately three weeks. Though not brand new, the vehicle has only 30,000 miles on it. In the three weeks since its purchase, Anderson, fellow instructor Travis Nicholas, and various other members of the Greenville High School staff have put more than 500 miles on the Volt. During that span, the vehicle has averaged 106.7 miles per gallon. The car has all the amenities of any modern, gas-powered vehicle, including air conditioning. Drivers can monitor the car’s operating conditions using a multi-function computer readout located on the dashboard. As with any other vehicle, the Volt’s mileage will vary based upon how it is driven. In addition to its extraordinary mileage, other appreciable qualities include the car’s extremely quiet operation and its negligible emissions. The Volt’s operating costs are also seen as a plus. “Charging the car is very inexpensive, much cheaper than gas” said Anderson. That, too, is dependent upon what type of charger is used. The 2.5-hour charge can be achieved with a 240-volt, or “Level 2,” charging station. A home charger, at 110 volts, will take significantly longer — 10 to 12 hours. 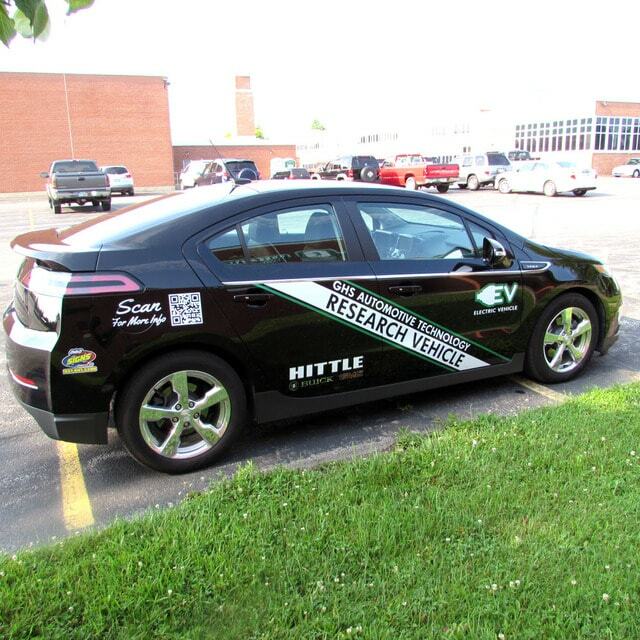 To keep the school’s Volt charged, the Auto Tech program is having a Level 2 charging station installed at the Career Tech parking lot this coming week, a first for Darke County. Once completed, Anderson said that anyone in the area with an electric car will be able to use the school’s charging station free of charge, for the immediate future. The Volt itself will be introduced to the community in stages. The first stage, from now until the beginning of the school year, will see members of the school’s staff using the car. As classes begin, the next stage will have the program’s advisory committee, composed of various business and industry partners in the area, test driving the vehicle. The final stage will involve reaching out to various organizations and people in the community, giving licensed, insured drivers the opportunity to experience the car. While local citizens may see the Volt around and about town, there are also plans to publicly showcase the car at events during the coming year, including at the Rolling 50’s Car Show in September. To learn more about the Greenville Auto Tech electric car project, go online to google.com/+GreenvilleAutoTech.